In this section you will learn the addition on number line. Counting on number line is the playful method through which the child is learning addition of numbers. Ask math, explains you the addition of numbers using colorful number line that makes the children more interested. Addition means plus. The sign of addition is + . Addition of the numbers on number line this method is used only for small numbers. For smaller grades the number line starts with zero. 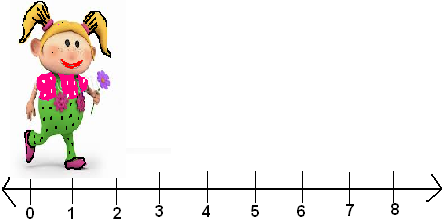 Number line is the line which starts from zero and has numbers 1,2,3 … on it at equal distances. It is used in addition,subtraction and multiplication because you can jump from one number to another number. On the number line move your step forward by one unit. Here is a child running forward and leaving a footprint at each step. At each pace, the child is running a unit (one) step forward. If a child move 6 steps forward that means the child reaches to 6 . Step 1: Draw a number line. Step 2: According to the question, from zero jump the first number. Step 3 : Mark the first number. Step 4 : From the first number jump second number . Step : 5 Mark it. That gives you the answer. Step 1: Draw a number line. Say up to 15. Step 2: From zero jump to 5. Mark it. Step 3: From 5 jump 7 number. Mark it . So the answer of 5 + 7 = 12 . Solve the following by drawing a number line.